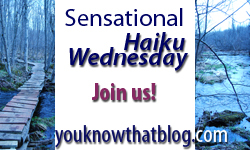 Ok, so the Challenge for our Haiku-versary did not go as expected, and we didn’t get a single new haiku-er to join us! Wow, colour me disappointed. Perhaps I didn’t publicize it as well as I should have. I don’t believe it was lack of interest, because… well, it’s haiku, and that makes it cool. ‘Nuff said. I’ll do something different for our next challenge, and someone will definitely win! Yes, safe travels, J-B!!! You’ll be missed…..have a great time! A hot one would be quite nice. Boy, could I use it! Woohoo! You’re first!! Good one – and I sooooo agree. I’m not looking forward to my jaunt east in a couple weeks though. It is definitely much more fun to travel then to be the one waiting at home. To that end, when Amoeba travels without me in a couple of weeks, I am having my sister come here! I saw your haiku and was reminded that soon (3 years) my 1st born will be travelling off to college and, of course, I will worry about her on the home front. oh yes, it’s always worse for those left behind. we’re the ones who need to cope. i love your travel haiku, jenn! ‘seventy three and / leaving for Sonoma State / where are pit stops on I-5? And Polly, your first verse is both my life and this year’s vacation, thank you! Happy Fourth to all! Heehee :) No problem Cathy – thanks for joining us again! You’re going to be a seasoned blogger before you even get set up on your own!! @Cathy…glad you could appreciate the haiku! Let us know when you get a blog up and running! Full of sentiment Jenn! OOOO that is my friend Cathy!!! It’s like you were reading my mind. Okay. I’m in and hooked. Thanks to Polly and Michelle. a trip across the pond sounds like fun. Maybe J-B will bump into Gwynnie or the Queen or one of the Spice Girls…Ahhhh…here I go assuming it’s England!! Ireland, actually, and then Scotland :) I don’t think he’ll be looking for any of those gals! Mine is very loosely connected to travel – there is camping & Vegas, and if you consider that I’m high on Vicodin we can call it a Hunter S Thompson-type vacation, right? Right on, Steph! Now go take it easy, and stay off your feet! *waves* Here we are! Come for a visit, my friend! Travel is such a great summer theme….fun haiku! Happy travels to J-B. Sorry about forgetting about the Haiku-versary week…but hopefully I am back now! I left two dogs, Adi and Katrin, and a cat, Amber. Wonderful!! Hope you’re having a fabulous trip, Jim!! Savour the moments of life. ’tis a one way trip. Relish the Moments of bliss. Not always to be endured. Make time for the rose! Well done, as always – and I shall indeed make time for the rose! Safe travels J-B! Have fun! My haiku this week is a special one for me, dedicated to my friend who recently lost her eldest child, and just welcomed her 5th child into this world. Thanks all! No blog for awhile, but I do enjoy writing. Who knows what may come? This is a traveling time of year. I like the new meme button.